Tiromel is a thyroid hormone. As a substance it contains synthetically manufactured liothyronine sodium which resembles the natural thyroid hormone tricodide-thyronine. The thyroid of a healthy person usually produces two hormones, the better known L-thyroxine and the aforementioned L-triiodine-thyronine. Since Tiromel is the synthetic equivalent of the latter hormone, it causes the same processes in the body as if the thyroid were to produce more of the hormone. It is interesting to note that L-Tiromel is clearly the stronger and more effective of these two hormones. This makes Tiromel more effective than the commercially available L-T4 compounds such as L-thyroxine or T4. Bodybuilders take advantage of these characteristics and stimulate their metabolism by taking Tiromel, which causes a faster conversion of carbohydrates, proteins and fats. Bodybuilders, of course, are especially interested in an increased lipolysis, which means increased fat burning. Competing bodybuilders, in particular, use Tiromel during the weeks before a championship since it helps to maintain an extremely low fat content, without necessitating a hunger diet. Athletes who use low dosages of Tiromel report that by the simultaneous intake of steroids, the steroids become more effective, most likely as the result of the faster conversion of protein. It is important to stress that a cycle should last no longer than 6 weeks and it should never be halted abruptly. As slowly as the dosage was built up it should also be lowered, one tablet every 3-4 days. Taking Tiromel for too long and/or at too high a dosage can result in a permanent thyroid deficiency. After doing such, one might need to be treated with a drug like Tiromel for life. It is also a good idea to first consult your physician and have your thyroid function tested. An undiagnosed hyperfunction would not mix well with the added hormone. An athlete should also be sure never to purchase an injectable form of the drug. It is generally an emergency room product, much too powerful for athletic use. Since Tiromel is the most powerful thyroid hormone athletes are using, this is generally not the starting point for a beginner. Before using such a powerful item, it is a good idea to become familiar with a weaker substance. An in-between point is T4 (L-Thyroxin 100) (synthetic T-4), still weaker in action than Tiromel. Once the user is ready however, the fat burning effect of this hormone can be extremely dramatic. Until recently, Tiromel was used by bodybuilders and female bodybuilders, in particular on a daily basis over several months to remain "hard" and in good shape all year round. Believe us when we tell you that to a great extent several bodybuilders who are pictured in "muscle magazines" and display a hard and defined look in photos, eat fast food and iron this out by taking Tiromel. The over stimulated thyroid burns calories like a blast furnace. Nowadays, instead of Tiromel, athletes use Clenbuterol which is becoming more and more popular. Those who combine these two compounds will burn an enormous amount of fat. Tiromel is also popular among female bodybuilders. Since women generally have slower metabolisms than men, it is extremely difficult for them to obtain the right form for a competition given todays standards. A drastic reduction of food and calories below the 1000 calorie/day mark can often be avoided by taking Tiromel. Women, no doubt, are more prone to side effects than men but usually get along well with 50 mcg/day. A short-term intake of Tiromel in a reasonable dosage is certainly "healthier" than an extreme hunger diet. 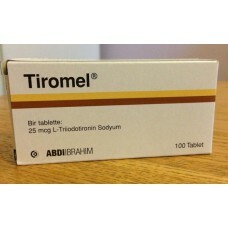 As for the dosage, one should be very careful since Tiromel is a very strong and highly effective thyroid hormone. It is extremely important that one begins with a low dosage, increasing it slowly and evenly over the course of several days. Most athletes begin by taking one 25 mcg tablet per day and increasing this dosage every three to four days by one additional tablet. A dose higher than 100 mcg/day is not necessary and not advisable. It is not recommended that the daily dose be taken all at once but broken down into three smaller individual doses so that they become more effective. It is also important that Tiromel not be taken for more than six weeks. At least two months of abstinence from the drug needs to follow. It is also important that the dosage is reduced slowly and evenly by taking fewer tablets and not be ended abruptly. One should take caution if considering using this drug. Tiromel comes with an extensive list of warnings and precautions which are not to be ignored. Side effects include, but are not limited to, heart palpitations, agitation, shortness of breath, irregular heartbeat, sweating, nausea, headaches, and psychic/metabolic disorders. It is a powerful hormone, and one that could potentially alter the normal functioning of the body if misused. When administering Tiromel, one must remember to increase the dosage slowly. Generally one 25 mcg tablet is taken on the first day, and the dosage is thereafter increased by one tablet every three of four days for a maximum dosage of 100 mcg. This will help the body adjust to the increased thyroid hormone, hopefully avoiding any sudden "shock" to the system. The daily dose is also to be split evenly throughout the day, in an effort to keep blood levels steadier. Women are more sensitive to the side effects of Tiromel than men, and usually opt to take no more than 50 mcg daily.